We’ve been composting yard and kitchen scraps almost as long as we’ve lived in our house – and that’s 26 years. We keep a bin in the kitchen where we toss the inedible vegetables and other non-meat scraps (though I do recycle shellfish shells) for the composter. 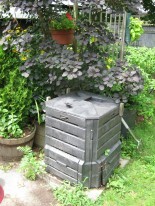 This last year, Jon set up a worm composting box so we’ve been sharing scraps with them. I was scrolling through TED talks today when I stumbled on this hopeful talk by Harvard law professor Jonathan Zittrain. In describing the underpinnings of the Internet, Zittrain imagines a society with fewer rules enabling more neighborly acts. His talks bring to mind the extraordinarily peaceful 15 years of WaterFire Providence, which brings thousands and thousands of individuals out on a summer’s evening to experience this inspirational work of public art and community. If you need a smile and your heart warmed, take the time to watch this video. The co-presenter in a workshop I attended recently noted that Thanksgiving was the perfect holiday for philanthropy. After all, it has both “thanks” and “giving” in its name. To all of our clients, friends and colleagues … thank you for the amazing work you do each day to make the world a better place. We are very grateful to be on this journey toward peace, justice and environmental stewardship with you. Half of kids on food stamps – shocking. “Nearly half of children will be on food stamps” read the headline on page B4 of my newspaper this morning. You can read more about it here. Then a story came on the radio that the president of our local Ivy League University earned $800,000 last year. That put her below the over $1 million in compensation received by her peers at 23 other private colleges, as reported in the Chronicle of Higher Education. The Chronicle of Higher Education also reported that over 58 private colleges now charge over $50,000 per year for tuition, room and board. For a family of four to be eligible for food stamps, their take home pay has to be less than $22,000 a year. according to that food stamp report. For many, myself included, a college education was the path to a better income. But today, over two-thirds of college students graduate with debt averaging over $20,000. Even in this recession, colleges continue to raise tuition and fees to their students – and that includes the public colleges of cash strapped states. The college graduation rate of black students nationwide is 43%, though much higher at those ivy leagues. But then again, I have to wonder how that breaks out by income of students enrolled as many lower and middle class students can’t afford private colleges and 3/4 of all African American students are enrolled at state universities, according to a 2007 article in the Journal of Blacks in Higher Education. “Income inequality is at an all time high.” Nonprofit income inequality is also shocking. Education is touted as the solution. I still ask: How much is enough? What do we owe each other? We agree. 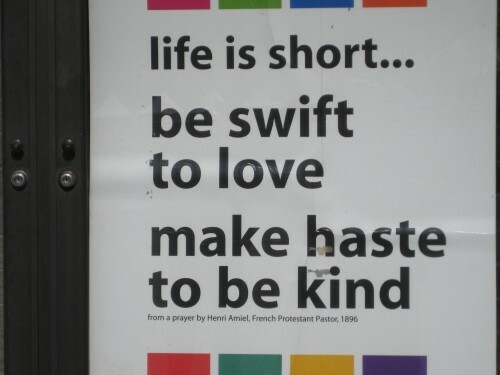 Our world could use a lot more kindness. We spotted this sign on Trinity Church in Boston. On the bike ride home from a meeting with a client this morning, I decided to take a quick inventory of the ways we’ve tried to lower our environmental footprint over the years. While I never feel sufficiently green, I hope that our small acts have had some small impact over the years. I thought you might enjoy seeing the list. It’s organized by the three Rs: reduce, reuse, recycle. Bicycling. Jon and I love to bicycle for pleasure and exercise. We are blessed with a number of lovely rail trail bikepaths in cycling distance from our home. Now, whenever I can, I try to take the bike to meetings that I can get to in a 20-30 minute ride. I’m still figuring out what “dress up” clothes work on the bike – so far, knee length skirts, capri pants, and some knee length dresses. (I’m a casual kind of gal and so are many of my clients so I don’t find myself in business suits a whole lot.) Jon’s better about biking than I am. I’m a wimp about the weather, so I don’t bike when it’s raining. And as its icy and snowy here a good part of the year, I skip those months as well. But I’m trying, and every ride is a time I’m not using fossil fuels. Walking. We live in a fabulous neighborhood, Summit, in a great city, Providence. Our neighborhood is like a small village. Within a half mile walking, we can be at an artisan bread bakery/coffee, myriad restaurants, a couple of pharmacies, a deli, an Indian grocery, our work and personal ATMs, cute cute gift stores, a flower shop, a Saturday farmers market and two city parks. We’re also really close to this incredible tree-lined boulevard that has just under a 4 mile round trip walking path and is bordered by one of the loveliest cemeteries on earth near a river and that the public is allowed to stroll through. Did I mention our wonderful neighbors? And the bus runs through it. I rarely drive to bank or run small errands. Tap water. We’ve got some pretty good tap water here in Providence and with a water filter, the taste and safety can’t be beat. We fill our water bottles (which we’ve got for the bikes anyway) and try to take them with us, even on long trips, to reduce our purchase of bottled water to infrequent occasions. Cloth napkins. We’ve used cloth napkins for all of our regular meals and for small dinner parties since we started housekeeping. I find them so much more pleasing than paper. If we are having a really big party, then I’ll use paper dinner or cocktail napkins. I save leftover napkins, plastic plates, forks, knives and spoons and wash and reuse them. ( Though now I’m nervous about doing that with all the concerns about plastics exposed to heat. Luckily, we really don’t use them very often… maybe once or twice a year). Buy local. I’ve been trying to revamp my buying habits to buy from local stores as much as possible with the hope that we can reduce the need for more big box stores and their miles of pavement. Unfortunately, the big boxes have been winning. Though I think the recession has slowed them a bit for now. Washing. We’ve always waited until we have a full load of laundry to run the washing machine. And a full load of dishes to run the dishwasher. I’ve been feeling guilty, though, about not stringing a clothesline across the back yard. I know I’ve been reluctant on the clothesline as I hated hanging clothes as a kid — cold fingers in the winter and leaning over the third floor porch railing to pull in the clothes line was just frightening to miss afraid of heights me. Energy. We switched all of the incandescent bulbs to compact fluorescents very soon after CLFs came onto the market, with the exception of the few lights that are on dimmers. We also upgraded our ancient refrigerator to an energy star version a few years ago. I now walk around the house with an eye to shutting lights off though we haven’t purchased one of those super shut off gizmos that you plug appliances into to stop them from consuming electricity even when they are off. And while we do own two cars, one of which is a minivan which was essential for a family of five, we also worry about gas mileage. I balance the minivan by owning a compact car that gets good mileage. Right now I’m driving a 2000 Honda Civic which does pretty well. Toxins: We try our best to buy non-toxic cleaning products and use a lot of white vinegar. We are organic gardeners which means I spend a lot of time picking evil bugs off my flowers (has anyone figured out how to scare away lily leaf beetles?) and tolerating a fair amount of diversity in the small amount of lawn we have left remaining. With all the rain this spring, we haven’t had much watering to do. Hand me downs: Thank goodness for friends and family with older children. With a few exceptions, we didn’t need to buy very much for our kids when they were babies and toddlers. We were very grateful to accept any offers of clothes, equipment, toys and furniture. We even rented car seats from the local chapter of the Red Cross. And while I do like new clothes, I also enjoy second hand stores where I’ve found some of my favorite wearables. Recycled paper: I look for recycled paper with as much post-consumer content as possible. That includes our office paper as well as toilet paper, tissues and the paper towels that feel very indulgent to me (though a standard roll of paper towels lasts about two weeks around here). I buy the paper towels that you can tear off in small sizes so we don’t have overuse them. Composting: We’ve been composting yard and kitchen scraps almost as long as we’ve lived in our house – and that’s 26 years. We keep a bin in the kitchen where we toss the inedible vegetables and other non-meat scraps (though I do recycle shellfish shells) for the compostor. We miss having the buckets for other scraps that we remember from our childhood – when the farmers came to get them for the pigs. Or at least that’s what we remember. Fall leaves go into the compostor, and with a fair amount of turning, some peat moss and lime now and then, we get enough compost to add to my flower garden and containers where I grown vegetables. Reusable grocery bags. I can’t remember when I started bringing my own bags to the grocery store. My sister bought me one of the cotton string bags many years ago that weren’t the best grocery bags but were all we thought of then. I’ve added to my collection over the years. It now includes about a dozen canvas bags, including some from the many years defunct Almacs Grocery Store (which closed in 1995), Bread & Circus (which became Whole Foods) and just about any conference that I’ve been to where they were handing out tote bags. I’ve been getting better about keeping a few in the trunk of my car so that I have them ready to use beyond the grocery store and can take them on clothes or other shopping sprees. Diapers. When my children were born (my oldest is 25, sons are 20), we signed up for a diaper service first thing. (I remember the stacks and stacks of newborn diapers that arrived each week when the twins were born — 140 total! Scary) The diaper service was heaven. I don’t even think there are diaper services anymore in our whole state. We were just at my niece’s baby shower and she informed us that there was one service in all of Massachusetts! Sad. As the kids got older and the diapering got a bit more under control, we laundered our own diapers. We also used washcloths rather than those icky baby wipes. I know that cloth vs plastic is still controversial as to which is more ecofriendly , but I just can’t imagine that producing and disposing of those plastics is better. We weren’t total purists and did use disposables when traveling and away from laundry. Paper. I worked for the Social Security Administration from 1976 through 1983. With my friend Sarah, we became the first workplace in downtown Providence to recycle office paper. We recycled boxes of outdated forms and computer paper, which the office burned through each week. We had to separate all of the paper (computer vs color vs white) and load them on the truck from Ecology Action for Rhode Island once a week. Unfortunately, the truck was always breaking down so Sarah and I frequently had to load the boxes into her VW Rabbit and my VW stationwagon and haul them over to Liz’s garage where Ecology Action stored the collected paper. Plastic bags. When I do end up with a plastic bag, I save them during the week and drop them into the recycling bin at the grocery store. Curbside recycling. Providence has curbside recycling for paper, newspapers, cardboard, #1 and 2 plastics and even textiles. (I wish they would take more plastics). They also take organic yard matter so we send them the stuff that doesn’t fit in our small compostor like branches and the leaves we simply don’t have room for. We rarely fill our regular trash bin, even half way. Clothing. Cotton socks with holes beyond repair are great for dusting. Torn cotton shirts make good rags. What can’t go into the yard sale or to Big Sisters will end up in the recycling bin. Okay, that’s all I can think of for now. I’ll probably think of more things as soon as I send this to publish. Wait… there is one thing more. Because we know we aren’t perfect and can’t do it all, we contribute to environmental causes. We believe in supporting organizations that are working hard to protect our land, water, air and diversity of life. We hope you will as well. We’d be happy to share the small things that you’ve done in this column. Last night I heard a lovely story of an unexpected and thoughtful thank you from a nonprofit to one of its supporters. I thought you’d enjoy hearing it as well. In just a few minutes, the 40+ board members, executive directors and staff who attended shared these words. Together, they described the perfect board experience. Purpose. Vision. Wisdom. Humor. Joy. Passion. Shared Values. Dedication. Generosity. Insight. Productive. Patience. Flexibility. Common Ground. Perseverance. Investment. Struggle. Eye-opening. Community-building. Caring. Deep Caring. Collaboration. Diversity. Gratitude. Leadership. Creative. Integrity. Teamwork. Unity. Heaven. Rewarding. Brainstorming. Listening. Support. Respect. Commitment. Interactive. Different. Communication. Last month, a thread came up on Twitter about Sprint’s customer service. I replied with a Tweet about my duplicate bill problem. Before the end of the day, I had a direct message from Twitter asking me to contact them directly and they would resolve the problem. I did and within another day, I received a phone call from customer service letting me know that the problem was solved. Who else will clean up the mess? What do litter, chicken poop, college debt and global warming have in common? They all involve someone passing their mess to someone else. Did we all ignore our parents when they told us we needed to clean up our mess and not leave it behind for the next person?